U.S. government debt yields added to a marked climb higher Thursday, making new multiyear highs as strong economic data continued to tempt investors into riskier assets. 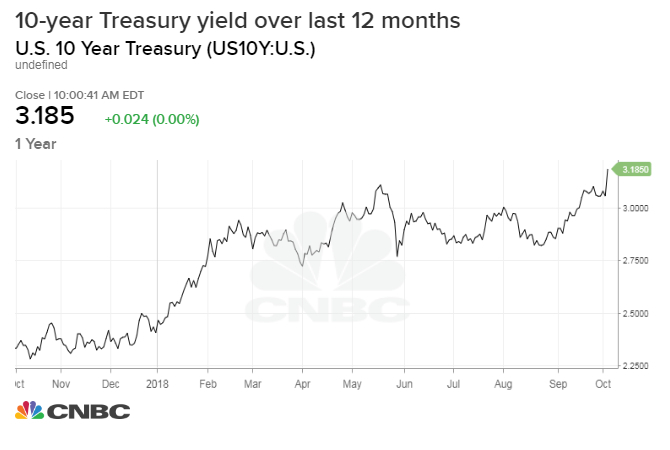 The yield on the benchmark 10-year Treasury note, which climbed nearly 12 basis points on Wednesday, hit its highest level since May 2011 early Thursday morning at 3.232 percent. As of the latest reading, the 10-year rate held higher at 3.187 percent at 4:12 p.m. ET, while the yield on the 30-year Treasury bond, which broke a new 2014 high Thursday, was up at 3.346 percent. Rates surged on Wednesday following data that showed that private payrolls rose by 230,000 in September which far surpassed the 168,000 jobs in August. The report adds to the now-widespread view that the labor market is near or beyond full employment; the government's monthly report on the employment situation, including the unemployment rate, is due Friday at 8:30 a.m. ET. Meantime, the ISM non-manufacturing index jumped to 61.6 last month, its highest level since 2008, when the index was established. Economic sentiment received another boost Thursday after the Labor Department said that the number of Americans filing for unemployment benefits fell to a near 49-year low last week, with initial claims slipping to a seasonally adjusted 207,000. In sum, the data provided additional evidence that the nine-year-old expansion in U.S. economy has yet to show signs of slowing down. "The bond market has thrown in the towel, no longer intimating that yields move up or down based on whatever the inflation outlook is at a given time," said Kevin Giddis, head of fixed income capital markets at Raymond James. "The likely reason for this is that the U.S. economy is strong and isn't really showing many signs of weakness, and as a bonus, prices have remained low and more importantly, unexplained," he added. The strength of the recent data has helped the Federal Reserve account for its three hikes in the federal funds rate so far this year. Two-year Treasury rates, sensitive to such interest rate adjustments, have routinely hit highs not seen since 2008 over the past few weeks. On Wednesday, Fed Chair Jerome Powell said that the U.S. central bank had a long way to go before interest rates hit neutral, suggesting to markets that more hikes could be on the horizon.